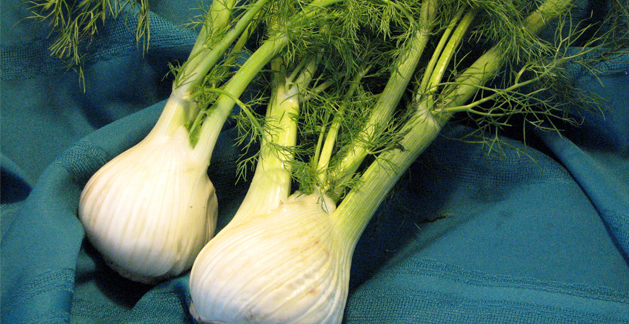 Fennel originated in the Mediterranean. There are two types of fennel. One type is commonly used for the flavoring quality of its feathery leaves. The second type is a favorite vegetable, known as the Florence Fennel. With this type, the swollen bulbous base is eaten. The bulbous base of fennel must be thoroughly washed and the stems trimmed off. Small "bulbs" may be left whole, but larger ones should be cut in half or quarters. To cook, simply boil in water until tender and drain very thoroughly. The fennel bulbs can be dressed with butter or olive oil, salt, pepper, and a pinch of mustard powder. Fennel can be chilled after cooking and served in an oil and vinegar dressing. The green, feathery leaves of fennel can be used in soups or salads. Store fennel in a plastic bag in the refrigerator for up to two weeks.